Stars are just fascinating altogether with many facts. Stars are huge balls of Hydrogen and Helium that are formed in galaxies from great big clouds of gas and dust over billions and billions of years. If you don’t already know, all stars are sun’s, just like our very own sun. To learn more about our very own sun, go to Our Star – The Sun section. Have you ever wondered or asked how many stars are there in the universe? This is a very hard question to answer, and while this question is always being answered by scientists there are many different answers depending on how you try and find the answer. Really the best answer is to say that there are billions upon trillions and that’s based on only the part of the universe that we can currently see. The answer is Infinite!! Within the infinite numbers of stars in the universe, from what we know and have studied, there are 7 different classifications of stars currently. That means there are 7 different types of stars temperature. O, B, A, F, G, K, M. These types of stars range in colour from Blue to White to Orange to Red. All different types and colour stars have different temperatures, different sizes, different mass and different characteristics. Within these types of stars there are other types of stars. 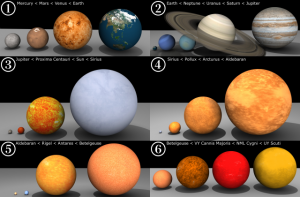 Like Dwarf Stars, Red and Yellow Dwarfs – Giant Stars, Red and Blue – Super-giants. These are the main types of stars however these are also other stars in the universe that we know of such as Brown Dwarfs and White Dwarfs, to Neutron Stars and Pulsars, to Binary Stars. For more information on any of these types of stars consult your science teacher or local library. Over millions and millions of years stars go through different stages of their existence. These stages are called ‘life stages’ or ‘life cycles’. What changes through these stages are the stars size, temperature, colour and luminosity – All of these factors are based on the size and type of the star. 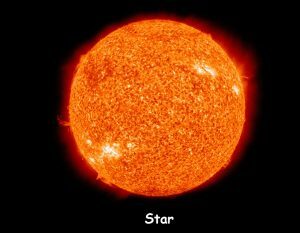 Stars sizes can range from about 1,000 times larger than our star, to about 100 times smaller. 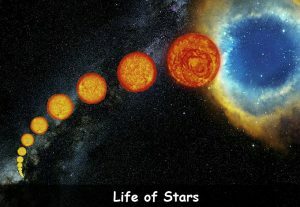 For more information on the birth and death of a star, see sections – How Stars are Born & Star Life-Cycle – Supernovas. # 1. Stars with the shortest lifespan are the largest. # 2. The most common stars are Red Dwarfs. Half the size of our sun, with a life cycle of 100 billion years. # 3. The nearest star to us is about 4.2 light years away. It would take around 70,000 years at a space craft’s fastest speed to reach. Q. What are stars mostly made up of? Q. 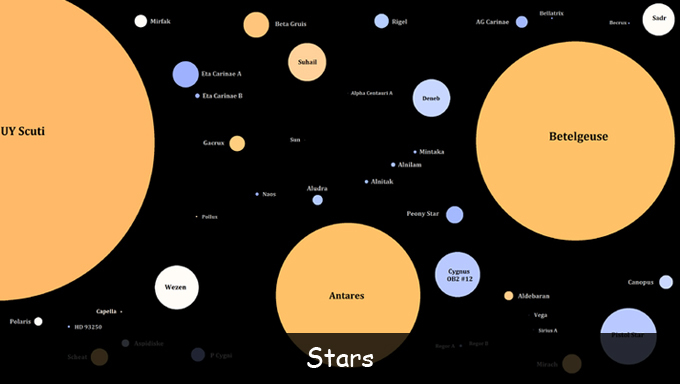 How many classifications of stars are there? Q. Name some different types of stars? Q. What is the distance in light years of the nearest star to the sun? Q. How many stars are there in the universe? Key Vocabulary Universe. Galaxies. Sun. Hydrogen. Helium.